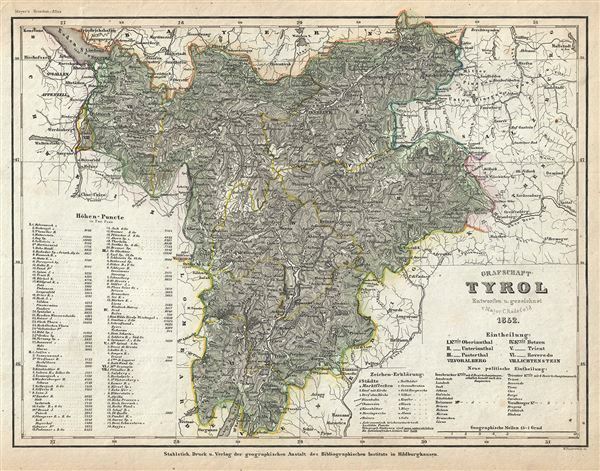 This is a scarce 1852 map of the County of Tyrol by Joseph Meyer. It covers this historic region from Lake Constance (Bodensee) south to Lake Garda and east as far as Lienz. It includes the modern day countries of Austria, Italy and Liechtenstein. An elevation table is included in the lower left quadrant of the map. Throughout the map identifies various cities, towns, rivers and an assortment of additional topographical details. Originally a state of the Holy Roman Empire, the County of Tyrol became a province of the Austrian Empire in 1814 and was later a part of Austria-Hungary. The region was divided between Austria and Italy after World War I.